I go back to school this week and I’m filled with mixed feelings. The holidays have been great and I don’t exactly feel like going back to school, but at the same time I’m excited because it is my final year of school. After this year I’m pretty much free to do what I like, how I like and where I like. I know that this year is going to be very big for me. Firstly I’m turning 18 in July, which means that I can finally get my driver’s licence. I’ve got my learner’s licence and have been practicing my driving for quite a while now (definitely not enough though). I wouldn’t say that I am the best driver in the world, because I am far from that, but what works in my favour with my driving is that I’m a very calm person and so I don’t get stressed on the road. My mom decided to give me her car because she is due for an upgrade. She’s going to get a car that has more space for family members. At the moment my sister, my brother (in his car seat) and I squish tightly together in the back seat like sardines in a can. In between in all of this I must not forget about my precious blog. I’m actually in the process of redesigning my blog to make it user friendly, so watch this space! I hope my blog grows and flourishes this year even more so than last year. There are these awards, called the Saveur Blog Awards, which begin in February I think. Basically this is the most prestigious food blog award and I would like to apply this year. In order to win I need people’s votes, but what can help me even more is if I get recommended by a previous winner and I just so happen to know one. I don’t want to ruin his or her identity because it may ruin my plans. I’ve been being really nice to this person for quite some time now and I’m hoping my hard wok will pay off! I do genuinely mean well in being nice, really. I’m not as nasty as I have just made myself out to be. The person seems very kind has an amazingly beautiful blog his or herself. I guess I just would really like to have this opportunity. The awards are all online, but then if your blog is good enough to make it to the finals, you get to go to the actual awards hosted in New York city. As you can see this is going to be quite the year for me but I think that I have just got to take it one day at a time and not work myself up about these things. Just focus on the present and what I can do now to better my chances of reaching my dreams. 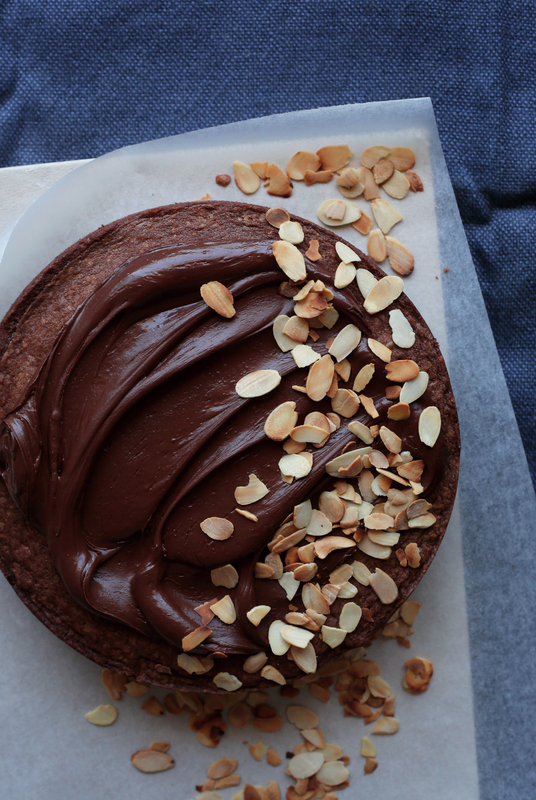 Anyway right now I’m just going to eat away my worries and have a slice of chocolate and almond cake. 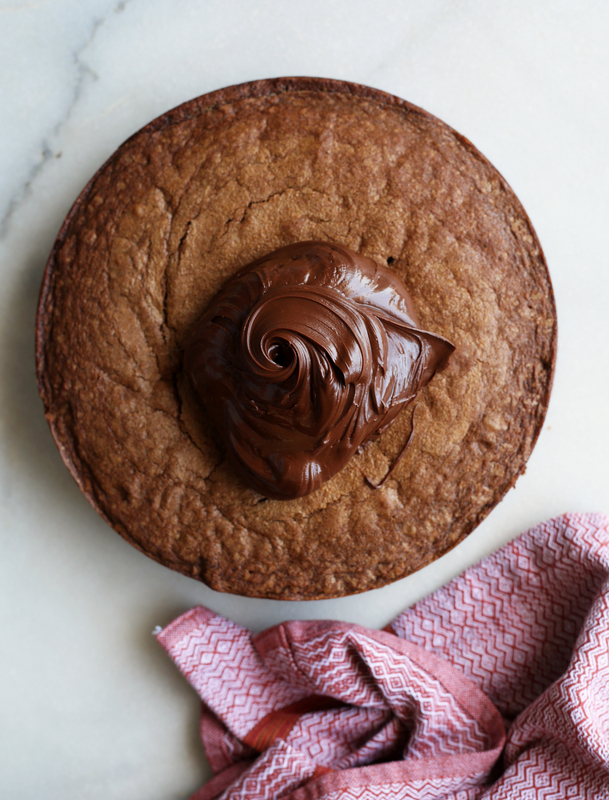 This cake is the perfect balance between a light chocolate cake sponge and a decadent dark chocolate and creamy topping. It is rich and sweet with the perfect addition of toasted almond flakes for salty flavour and crunchy texture. Preheat the oven to 160 degrees Celsius and grease a 23cm round baking tin. 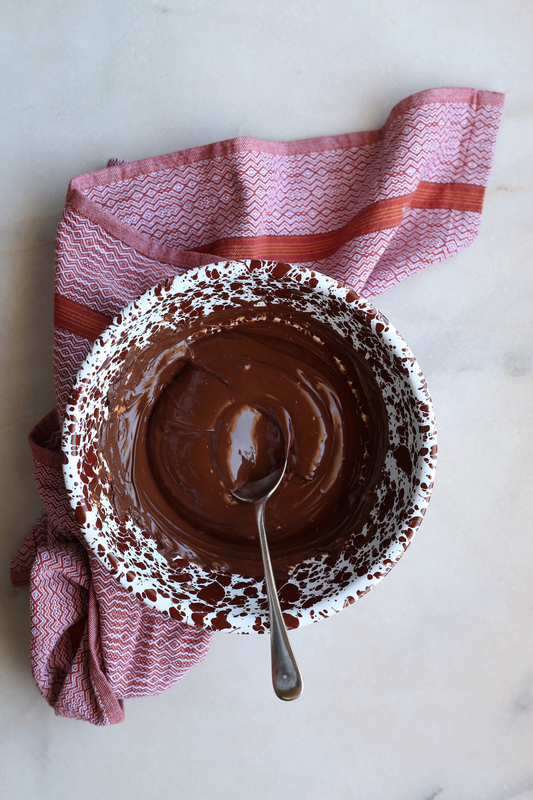 Melt your dark chocolate in a heatproof bowl over a pan of water on a medium heat. Stir occasionally so that the chocolate doesn’t burn. Once the chocolate has melted, leave to one side for the moment. In a bowl, cream the butter and sugar until light and fluffy. Add the eggs one at a time and continue mixing until well combined. Next add the flour followed by the melted chocolate and milk. Mix until a smooth batter forms. Add the remaining ingredients, bicarbonate of soda, baking powder and vanilla extract, and mix until well combined. 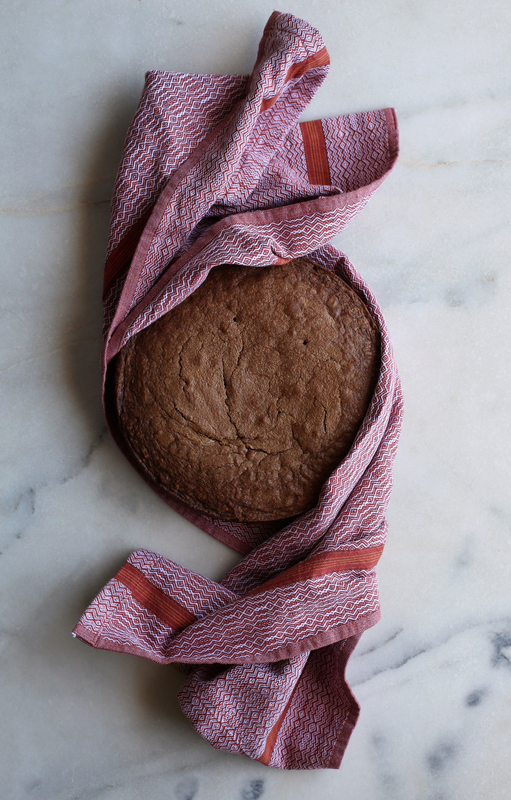 Pour into your prepared baking tin and place in the oven to bake for 40-50 minutes. By that time it will have risen slightly and formed a slightly golden crust. Poke with a toothpick to test if it is cooked all the way through. If the toothpick comes out clean remove the cake from the oven and leave to cool completely before removing from the cake tin. Prepare your topping minutes before assembly. 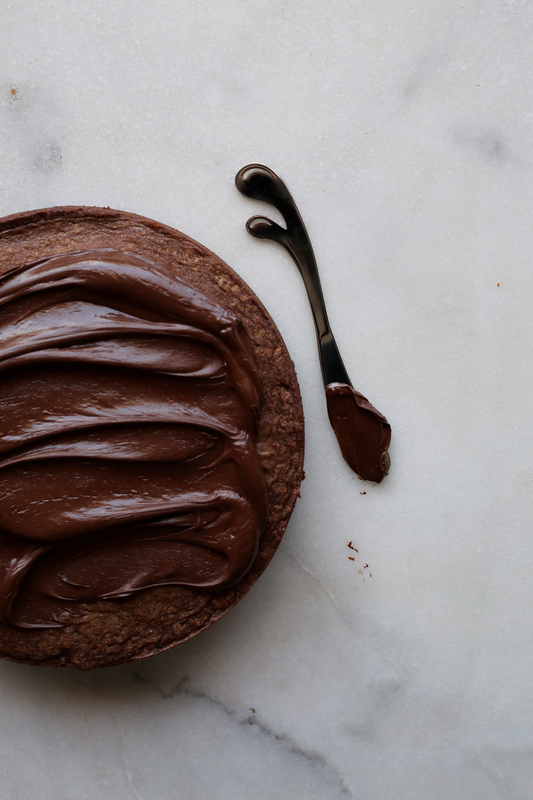 Melt your dark chocolate in a heatproof bowl over a pan of water on a medium heat. Stir occasionally so that the chocolate doesn’t burn. Remove from the heat and add your butter. Mix well. Leave to one side. Place your almond flakes in a pan over a medium heat and toast until golden brown. Stir them regularly so that they don’t burn. Once roasted/ toasted remove from the heat. Place your cake on your serving dish. 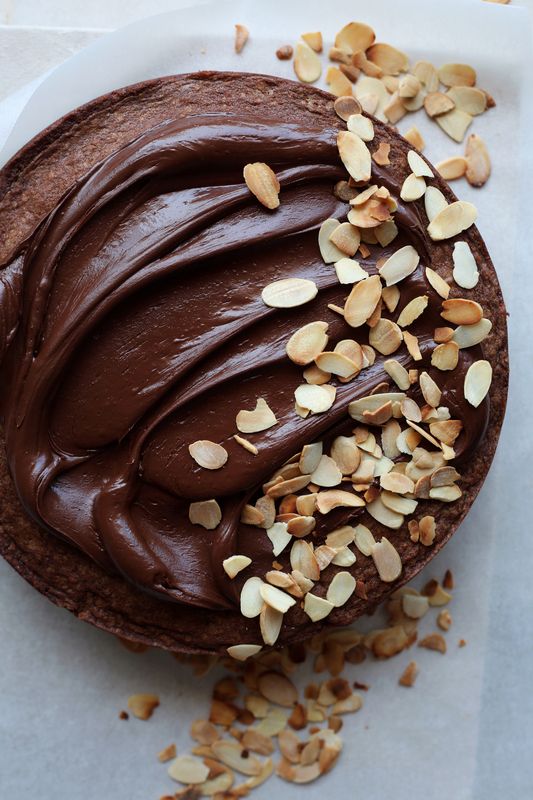 Top with a generous dollop of your chocolate topping and then using a flat knife, spread across the top of the cake. 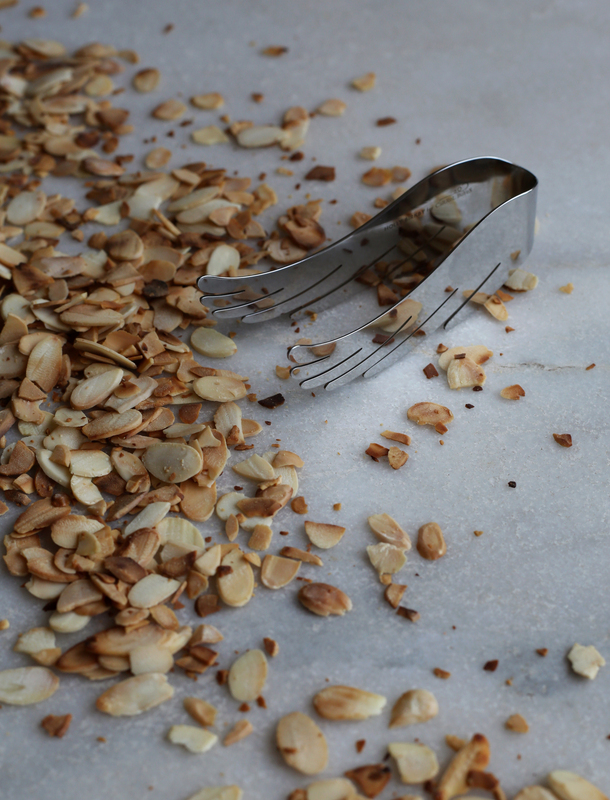 Sprinkle with your toasted flaked almonds. First off, happy New Year everybody, and secondly I’d like to update my whereabouts at the moment. I’ve taken a week holiday within my holiday session to camp in the beautiful outdoors with my second family. Technically they are my cousin’s cousins and auntie and uncle, but they are more like my second family (as I’ve said before). I only really see them about once or twice a year, but still I’d like to reinforce my point for the third time now that they are my second family. I’m camping with them in the most luxurious tent. The floors are covered with hand-woven grass carpets, but wait it gets better, I get to sleep in a two person bed for the first to time in my life. To be quite honest I actually prefer my single person bed at home and miss it dearly. Thanks to the camping situation, I haven’t been on my cell phone for a few days now and it actually feels quite good. I’ve had the time to read a book (which has been so educational (I’m reading an old cookbook written in the 1940’s about local Cape Dutch food)), to swim a lot, to cook a lot and most of all to interact with my second family. One would think that this would be enough to make one very happy, but not this one at least not completely. I am missing my blog very much. I decided to open my camera bag and create a new recipe. It was natural for me to make lollies simply because the temperatures have been so high here. So my second family and I took our bicycles and cycled to the shops to buy some ingredients. It was so real to experience the process from putting an effort into purchasing the ingredients to finally eating, rather sucking, and some sweet plum lollies. This has got to be one of my simplest recipes for the simple reason that I was able to make these lollies whilst camping (so you have no excuse not to make them). They are super delicious and are the summer version of poached fruit. It is the same process to make them but in the end the fruit is blitzed up and frozen. They are super delicious sweet and slightly spicy with the addition of cloves. Remove the pips from the plums and place into a large saucepan along with the remainder of the ingredients over a medium heat. Bring the mixture to the boil and then turn down the heat to a light simmer. Leave to simmer for 5 minutes. Remove from the heat and leave to cool. Once the mixture has cooled, strain it through a sift or colander. Pour equal amounts of the mixture into your yogurt cups and place in the freezer for 30 minutes. After 30 minutes place the ice cream sticks into the lollies. Leave to freeze over night or for 12 hours. To remove the lollies from their casing, dip them in hot water and pull out of the casing. Wishing everyone a very merry christmas and a happy holidays! Here are a few snaps I shot over the past two festive days. Hope you all have a wonderful time! I really don’t feel like typing out long paragraphs about my life at the moment, so I’m gonna keep this short and sweet just like these little mince pies. I am finally on a real holiday you guys. You must be thinking, but Ben why are you still working? That’s a good question actually! Reason being, my auntie ordered 40 homemade mince pies from me and I have to make them for her before she arrives this evening. Obviously I am more than happy to make them for her, and would make 100 if I were asked to. It is quite the job to take on though, especially because I’m on holiday. Anyways, I am happy that I got help from the wonderful Olivia van Hoogstraten (she told me to write that) who is my cousin’s cousin, but basically is just another one my cousins. As I’m sure you will notice, we had to shoot this post on the floor of my auntie’s beautiful holiday home. Reason being, the natural light in the kitchen isn’t great and so my next best option was the floor. Yes it may seem a little gross, but we cleaned it well and nothing came into contact with the ground at any time. I hope you enjoy this post! Mince pies have never really been my cup of tea. I find them to be over sweet and slightly stodgy. I knew that I had to make a mince pie post for Christmas so I turned my thinking cap on and came up with a solution. The filling is obviously store bought mincemeat, with the addition lemon zest and juice to cut through the sweetness of the mince pie. For further tanginess, I served the pies with Greek yogurt and cherries, which completely balance out and eliminate the sickly sweetness of the pies. The pastry is light and crispy. Grease a mince pie baking tray. If you don’t have one, you could use a muffin tray. For the pastry, mix the flour and butter in a bowl. Once the mixture resembles breadcrumbs, add the icing sugar and egg yolk. Mix untill all ingredients are well incorporated. Now add the milk a tablespoon at a time until you form pastry dough. Wrap in plastic wrap and leave to rest in the refridgerator for 30 minutes to an hour. Prepare your filling. Mix the the filling ingredients in a bowl and leave to one side. Flour a clean working surface. Roll out the pastry dough and cut out 12 circles using a glass or cookie cutter. 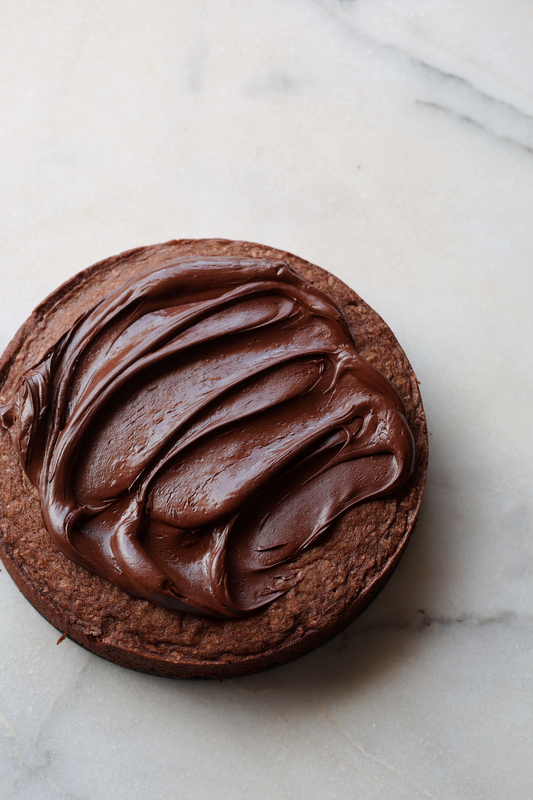 Cut them a size that is bigger than your pie moulds. Place 1 circle in each pie mould and press to the shape of the mould. Fill with a heaped teaspoon of the filling. Roll out another sheet of pastry. Cut long strips out. Arrange the long strips over the pies in a criss cross formation. Cut off any excess pastry. Brush the tops with milk and sprinkle with a little castor sugar. Place in the oven and bake for 15-20 minutes untill golden brown. Once cooled, lightly dust with a little icing sugar. Copper vase from Carrol Boyes. This year my auntie has given over the role of Christmas dinner maker to us, the children. Technically we aren’t children any longer, but are young adults ready to face the big world together. My auntie is very traditional which means Christmas dinners include the usuals, meatloaf, Turkey, ham a green salad (you know what I’m talking about). Don’t get me wrong the usuals are great and I love them, some of my best friends are usuals. I think as the new generation, us children should shake it up a bit. Not completely, keep with the classics, but give them a new fresh spin of life. Besides for the fact that I am one of the only people who can cook and will most probably land up doing it all myself, my auntie (how can I say it nicely) knows exactly what she wants and how she wants it done. I just realised that I am no different to her. I have no doubt that even though she has handed the task of Christmas dinner over to us young adults, she will get involved and give her opinion on certain issues. That is why us, young adults, have decided to keep what we are going to make a secret. We’ve learned from experience that a large family is generally filled with lots of large opinions. The task she has handed over to us is going to be a challenge one that will only make us stronger. We created a Whatsapp group to throw some ideas around. Some said sushi, others said that we should make steak rolls. Sure these are delicious things, but they are so not sit down Christmas dinner kinds of meals. At first I thought we should go about the meal in a traditional manner, but everyone decided it would be best to go in the opposite direction. So I threw in an idea, what if we made kebabs with a traditional Christmas twist. Everyone seemed to like the idea and so I went on to come up with this amazing idea which I am pretty chuffed with. What about Meat loaf koftas? To make a normal meat loaf mixture and then simply shape it into kofta shapes. I personally thought that it was and still is a brilliant idea! It’s the best of both worlds; classic with a new fresh twist. I’ve never really liked meat loaf. It’s so thick and dry and rich. What I did was took a traditional meat loaf recipe with the addition of a few simple ingredients and turned it into koftas. For those of you who don’t know what a kofta is, it is a traditional Moroccan kebab come sausage like cooked meat. It’s basically meatballs on a skewer and traditional cooked over hot coals or in a pan. I went for a healthier and cleaner alternative by baking them in the oven. They are light and crisp with a crumbly succulent texture. The addition of raisins and mixed spice to the mixture, balances out the saltiness from the Parmesan cheese and rosemary. These are perfect served over a bed of my tomato bulgar wheat salad. The salad has a sweet and tart flavour from the juicy tomatoes. The addition of turmeric turns it into a bright yellow bulgar wheat salad. Preheat the oven to 180 degrees Celsius and grease a baking dish with a little oil. In a bowl, combine the white bread and milk. Leave the bread to soak the milk for 5 minutes. After that time, cut off the crusts (discard them) and chop the white bread into small pieces. Place all of the ingredients into a large mixing bowl and mix together until well combined. Prepare 12 skewers. Using two hands shape a piece of the mixture, which is about the size of your palm, across each skewer. Squeeze tight so that they don’t fall apart. Continue until you have used up all of the mixture. Place the koftas onto your prepared baking dish and into the oven. Leave to cook for about 30-40 minutes. Turn them regularly in the oven so that they crisp up. After that time they will be golden brown in colour. Remove from the oven and serve with lemon. In a frying pan, melt some butter in a little olive oil over a medium to low heat. Add your chopped onions to the pan along with the salt. Stir until the onion becomes translucent. Add your turmeric, and chopped tomato to the pan and continue stirring for a further two minutes. Add the tomato puree and brown sugar. Mix and then leave to cook for 2 minutes. Add your bulgar wheat into the pan. Stir until the bulgar wheat absorbs all of the juices from the pan. Pour your water into the pan and bring to a light simmer. Reduce the heat and cover with a lid. Leave to cook for 15-20 minutes or until all of the liquid has been absorbed. Once it has cooked, fluff it up with a fork. Serve warm or at room temperature. Serving suggestion: serve the koftas over a bed of the tomato bulgar salad with a dollop of plain yogurt and a sprinkle of rosemary. I’m sitting in my ‘office’ (my bedroom) with my little brother. He’s drawing with his pencil crayons and I’m working. We are both in our pyjamas and don’t plan on changing any time soon. He keeps on interrupting me and my work with his asking of “What colour is this,” and “Benny, dis colour not working.” We are sharing a slice of French toast. When I woke up this morning I felt like eating something sweet for breakfast. I thought I would make myself some toast, but then decided it would be better to make some French toast. For those of you who don’t know what exactly French toast is, it is amazing. It is stale bread soaked in eggs and milk and then pan fried in melted butter until golden and crisp. Thanks to it being Christmas time, I thought that I would give a Christmassy take on French toats with the addition of a few simple ingredients, ground cinnamon, vanilla extract, and orange zest; similar to my Christmas challah. As the bread soaks up the eggy custard it also soaks up all of the sweet and spicy Christmas flavours. And then as it fries away in a buttery pan, it crisps up and the orange zest becomes almost crunchy and sticky. It literally took me a few minutes to put this together, which is record time as my little brother was helping me. Enjoy with any toppings of your choice, I went with plums, syrup and orange zest. Crack the eggs into a large high-sided plate together with the vanilla extract, cinnamon, orange zest and milk. Mix until all ingredients are well combined. Place a slice of bread into the custard like mixture and leave to soak for a minute on each side. Melt some butter in a frying pan over a medium heat. Fry the soaked slice of bread on each side for about 2 minutes or until golden. Repeat this process with all slices of bread.